My first hike of the new year was to the Lexington Reservoir near Los Gatos. Fellow USGS postdoc Kayla Iacovino (@kalyai) came along to help search for blueschist-facies rocks in what’s locally known as Franciscan Complex melange. Now, I’m getting pretty good at spotting serpentinite – not that it isn’t fairly distinctive – but I’ve been hoping to see some blueschist as well. I found this USGS publication which shows a sample of blueschist from a spot “near” Lexington Reservoir in Santa Clara county, so that was where we headed. The Lexington Reservoir is a county park (there are so many parks around here you can barely go for a hike without ending up in one). It has its own fault zone, crosses several faults, and cuts right through some exposures of Franciscan rocks, including serpentinite, greywackes, and other things that result from taking chunks of the ocean floor, subducting them, and then spitting them out at sea level. Like every reservoir in California right now, it’s also well below capacity, as you can see in the next photo (that path leading down to the boat launch should be underwater, and boating has been banned indefinitely). But we were after the blueschist. Andrew Alden has a couple of great posts on blueschist in the East and North Bay, including at Ring Mountain and exposures in Oakland and Ward Creek. Basically, blueschist is a category of metamorphic rocks that form at high pressures and low temperatures. 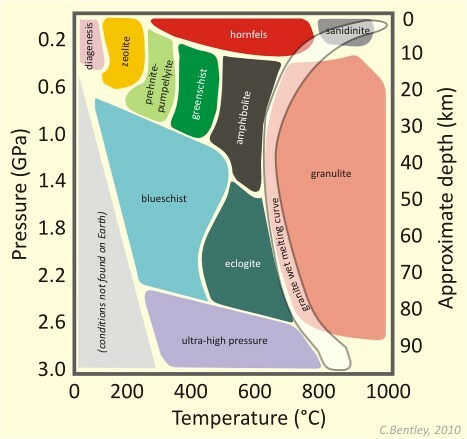 In Callan’s diagram below, that includes pressures from around 1 to 2 Gigapascals and temperatures below 500°C. (The coolest magmas erupt at 700°C, so rocks in the blueschist zone aren’t even close to melting.) Glaucophane, a kind of amphibole is the mineral that makes it blue, but it can also contain things like lawsonite, chlorite, omphacite and epidote, which are green rather than blue. In the Franciscan rocks, it’s often found with serpentinite (what you get when you subject ultramafic rocks to the same sorts of temperatures and pressures). Image redrawn and modified by Callan Bentley from Figure 3 of Bousquet, et al. (2008), which is modified from Oberhänsli, et al. (2004), and also from University of British Columbia (1997), which is modified from Yardley (1988). One thing that’s immediately apparent here is the way the shoreline’s changed with the drought – there’s a lot more visible in the satellite image than mapped on the quadrangle, which is dated to 2002. The scarp and landslide, which are much more visible in Google Earth. It was very cloudy that day and unfortunately that’s bad for making the rocks stand out, but I’ll include some enhanced/unenhanced photo pairs to show off the amazing colors in the rocks. The glaucophane gives them that striking blue-jeans-blue shade, although in this outcrop, it was mixed in with a lot of serpentine and (possibly) lizardite. …and again with a 25% dark blue filter applied. …and with one (25% dark blue again). The landslide/debris flow deposit was very soft and easy to climb, but I imagine that without the rain it would be more difficult to navigate (more loose dirt). At any rate, there were lots of easy-to-access boulders in the stream next to the path, and the bottom of the debris deposit was perfectly fine to scramble onto. If you go for a visit when it’s dry, I’d stay off the upper parts of the deposit. Kayla checking out the upslope terrain from the bluest bit of the deposit. On our way down the path, we ran into what I’m pretty sure is a rough-skinned newt (Taricha granulosa granulosa), which are apparently known for the toxin they exude from their skin when threatened. This one was pretty chill, and though we took some pictures, we didn’t harass it unduly as it made its way across the path. The Lime Kiln trail continues up the Lime Kiln Fault and the drainage for quite a ways, and we hiked to an overlook so we could get a good view of the Vulcan Quarry that operates upstream. It looks like an aggregate (gravel) quarry, although the company website isn’t very illuminating. It’s hard to imagine what else they could be going for here, since they appear to be well into the greywackes and I’m not aware of any economic use for the blueschist-facies rocks that appear to be cropping out in the hillside. A nice cutaway view of the hill. 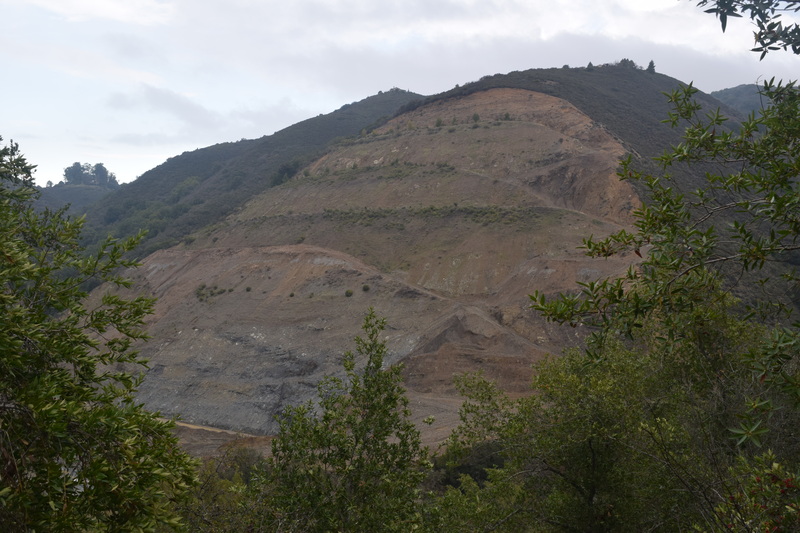 The dark patch on the lower third of the hill is probably the same sort of rock we were looking at in the landslide. I can’t say that the weather cooperated with us, but it was a great little hike for seeing a whole slew of Franciscan rocks. In doing my blueschist research, though, I’ve been particularly salivating over Andrew Alden’s amazing Ward Creek blueschist photo. That may have to be my next hike! In about 1973, I took several great classes from Dr. Harold Noltemeier at the Univ. of Okla. Then, plate tectonics was mostly accepted theory, but that question “are you a drifter” was still posed by a small minority. I received an A+ for a term paper on the blueschist facies then, but I’ve never had the opportunity to see those rocks in the field. Last year on vacation, I picked up some rocks on the beach just north of Mavericks, which I believe are greenschist or blueschist. However I gave away my tile saw and rock polisher years ago. This summer we plan to revisit the Big Sur, and I see that some Franciscan facies outcrops are in around that park. My goal is to acquire a blueschist sample, to slab, polish, and mount, in memory of that term paper nearly half a century ago. Do I have a chance of succeeding? I will have a hammer hidden in my backpack. Your photos are much appreciated! Hi Vance – I think you do! I encountered plenty of serpentinite while camping near Big Sur, and the two are often found in the same location. This guidebook seems to indicate that it’s possible to find blueschist in the area as well.